This 19" strand is composed of natural Tahitian pearls that have been hand-selected for their unique shape and iridescent color. No detail is missed - the hand-made while gold clasp is adorned with a carat of striking, white diamonds. 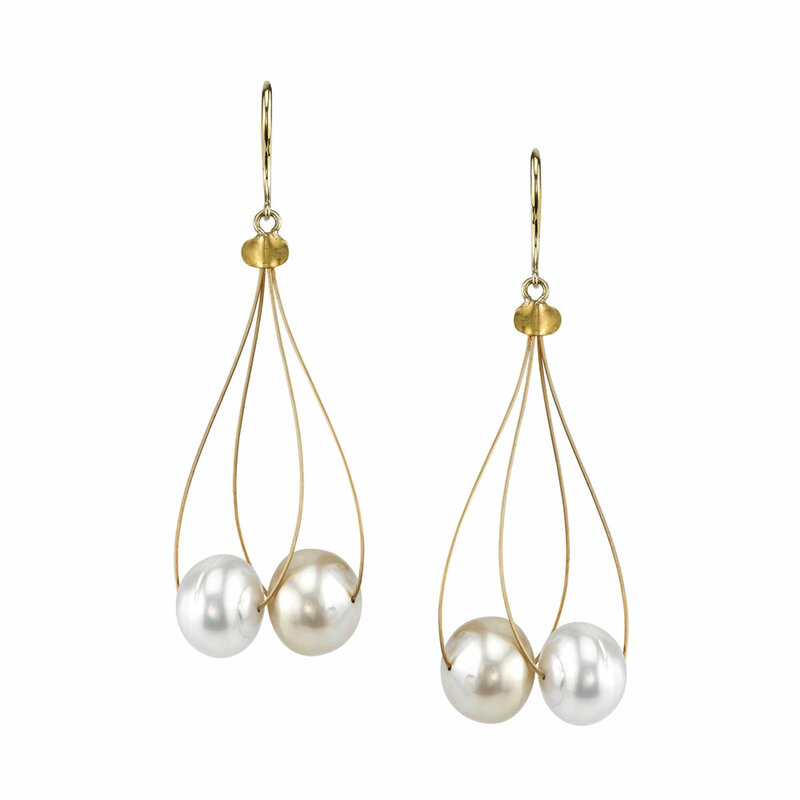 The average size of each pearl is about 17 mm. Due to their naturally dark color, Tahitian pearls have become some of the most sought after, expensive pearls in the world. Unlike black freshwater and akoya pearls, which are irradiated or dyed, Tahitian pearls obtain their look naturally and can be found in an incredible array of iridescent color. Due to their vast color range, matching these pearls into a perfect, finished strand is an enormous task requiring thousands of loose pearls. Pearls are one of the first gems adorned by women and have been used as decorative items as far back as the 5th century BC. Over time, pearls became a status symbol personifying wisdom, power and wealth, and happen to be the only gemstones made by a living organism. When a foreign substance passes through the organism of a mollusk and irritates the mantle, the mollusk begins to coat the irritant with a substance called nacre. Layers of nacre eventually form a pearl ranging in a variety of colors and shapes. Round pearls are the most expensive and uncommon, followed by baroque pearls, which are irregular and uniquely shaped. This 17.5" strand is composed of natural Tahitian pearls that have been hand-selected for their unique shape and iridescent color. No detail is missed - the hand-made while gold clasp is adorned with 1.57 Ct of striking, white diamonds. Due to their naturally dark color, Tahitian pearls have become some of the most sought after, expensive pearls in the world. Unlike black freshwater and akoya pearls, which are irradiated or dyed, Tahitian pearls obtain their look naturally and can be found in an incredible array of iridescent color. Due to their vast color range, matching these pearls into a perfect, finished strand is an enormous task requiring Pearls are one of the first gems adorned by women and have been used as decorative items as far back as the 5th century BC. Over time, pearls became a status symbol personifying wisdom, power and wealth, and happen to be the only gemstones made by a living organism. When a foreign substance passes through the organism of a mollusk and irritates the mantle, the mollusk begins to coat the irritant with a substance called nacre. Layers of nacre eventually form a pearl ranging in a variety of colors and shapes. Round pearls are the most expensive and uncommon, followed by baroque pearls, which are irregular and uniquely shaped.